A drink that is a cross between a collins and a sour. It consists of lime or lemon juice, club soda, and alcohol. Unlike the collins and sour, it contains no added sugar. A fruit juice that combines rock candy, rye whiskey and fruit slices. Rum can be made from 2 different raw materials: it can be distilled directly from the fermented juice of crushed sugar cane, or, once the sugar is extracted, it can be made from the remaining molasses. Some rums contain dunder, which is a residue from the previous distillation and makes for a more pungent product. Three main types of rum are made in the West Indies today. Very light(white or silver) rums hail from the Virgin Islands or Puerto Rico. These require little aging and are relatively tasteless and oderless. Golden rum, also known as anejo, though still of the light-bodied type, has more taste and pronounced character. Darker, aromatic, full bodied rums such as Myer's are produced in Jamaica. These are distilled by a slower and different fermentation process, which allows for a fuller richer, molasses like body to develop. All rum is colerless when first distilled, and those that are aged for only a year are often colored with caremel. Even heavy bodied rums that are aged in charred oak casks for as long as twenty years are subject to artificial coloring. Medium and heavy bodied rums are usually aged between two and twenty years. The oldest native American whiskey, originally manufactured in the 1600s by Scotch and Irish settlers in New York. Rye is a very full bodied drink with a pronounced character, and perhaps for that reason, it has faded in popularity in the land of its origin to the point where it lags behind all other varities of whiskey in consumption. Many people confuse rye with blended whiskey, but the two are far from being the same. Rye must be made with at least 51% rye grain, the rest being corn and barley. Rye is aged in in new charred oak barrels for at least 2 years. An orange flavored liqueur with a hint of chocolate, from Israel. This traditional drink of Japan, a bit on the sweet side, is commonly referred to as "rice wine", when in fact it is actually rice beer. Although it resembles a wine in taste and appearance, it is not made from grapes. It is fermented from rice and malted barley. Sake is usually served warm, as the heat brings out its superior bouquet. An Italian liqueur flavored with anise. The Italians often serve it "with flies", which is actually 3 or 4 coffee beans on top of a glass of sambucca which is then flamed. Made with whiskey, gin, rum, or brandy, with port wine floated on top, or with wine, ale porter or stout, with a sprinkle of nutmeg. The word "schnapps" (from the German Schnappen, to snap) refers to a mixture of vodka, gin, brandy or other spirit. In Scandanaviathe word is snaps and almost always means Akvavit. In the U.S. the term has taken on a new meaning to identify a whole new generation of intensely flavored, sweet, inexpensive liqueurs of moderate strength (22 to 30% alcohol by volume). The Dekuyper brands of Applebarrel and Peachtree schnapps, while not the first in the U.S market,are generally credited with launching the schnapps craze due to a technical breakthrough that yielded a fresh rather than cooked fruit flavor. Other flavors such as cola, cinnamon, rootbeer, tropical(hot shot), butter scotch, strawberry hazelnut, lemonade, apricot, peppermint, blueberry, bubble gum, tequila, and numerous others are making the schnapps a dominant force in the liqueur market. The most unique schnapps has to be Gold schnapps, which is peppermint schnapps with very fine flakes of gold foil added in. Scotch whiskey is produced only in Scotland. Some Scotch whiskeys sold in the United States are produced in Scotland and then bottled in the U.S. Most are blends of malt whiskeys and grain whiskeys and typically contain the products of fifty or more distilleries, with the better and more expensive brands containing more malt than grain. Some Scotches are blends of different malts and these are known as vatted malts. In recent years, unblended scotches or single malts like Glenfiddich have achieved a considerable popularity. A straight shot of spirits taken neat. Made like sangarees with the addition of lemon juice and a twistof lemon peel. Served in an old fashioned glass. A brandy made from plums, fermented and distilled. Very high alcohol content. Sloe gin is a liqueur made from the sloe berry, a kind of small, wild plum, which is soaked in gin. Small juleps, served in an old fashioned glass. Made from muddled sugar, ice cubes, whiskey, gin, rum or brandy and soda water. The term is usually applied to bourbon whiskey; this whiskey is made from a blended grain mash consisting of new mash and a portion of mash from a preceding mash. Made of lemon juice,ice, sugar, with any basic liquor. The oldest American liqueur, well known the world over, Southern Comfort is a blend of bourbon, peaches, and peach liqueur. It is dry and strong (100 proof) as liqueurs go. Produced in St. Louis. A high quality vodka produced in the Soviet Union and favored by many serious vodka drinkers on the other side of the iron curtain, where they enjoy vodka without mixers of any type. 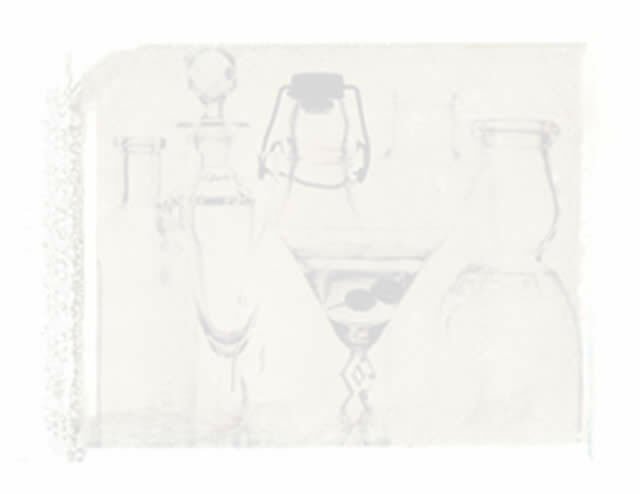 Some store their Stoli in the freezer, where it thickens up slightly, and serve it in chilled liqueur glasses. In the United States, a blended straight whiskey is a blend of several mature rye or bourbon whiskeys, as opposed to a blended whiskey in which bourbon or rye whiskey is mixed with an inferior whiskey or a grain-neutral spirit. Cordial made from orange peel, spices and very strong spirits, very sweet. Italian in origin. (Caloric Punch) a Scandanavian liqueur made from batavia, arak, tea, lemon peel and 70 other spices. Also called caloric punch for its warming properties. Originally a tall rum cooler filled with cracked ice that was swizzled with a long twig or stirring rod or spoon rotated rapidly between the palms of the hands to produce frost on the glass.